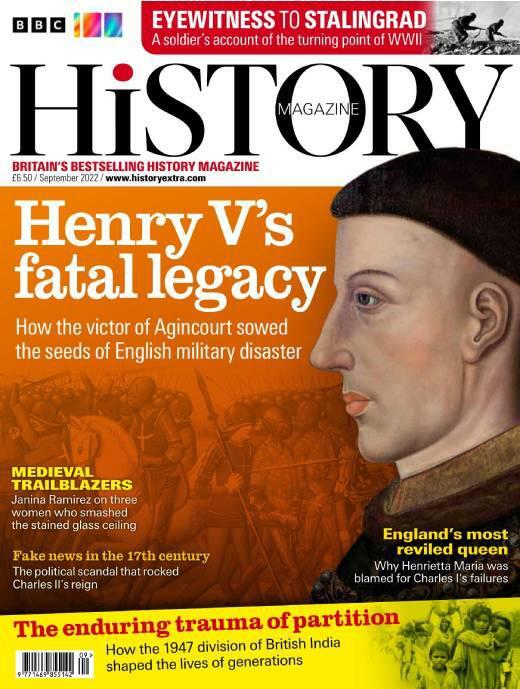 “Just in case we were in danger of forgetting, the latest edition of the BBC History magazine kindly reminds us that this month marks the 400th anniversary of the death of perhaps the world’s greatest ever author, William Shakespeare. The magazine commemorates this festive occasion by claiming to reveal “The great mysteries of the playwright’s life”. This indeed promises a lot, but one wonders whether they will confront a true mystery of their own making – why have they used a picture of someone who is not Shakespeare on the cover? “Are they suggesting that the man on the cover – Sir Thomas Overbury – wrote the plays? Are they nominating him as the latest candidate to take his place alongside Christopher Marlowe, Francis Bacon and Edward de Vere, as the true author? Surely not? As it turns out, no. But then why use a picture of someone who is definitely not Shakespeare to promote Shakespeare? “This common mistake all started in 2006. As explained on the Shakespeare Birthplace Trust website, this picture, the so-called “Cobbe” portrait was “identified” as being a portrait of William Shakespeare. There is not much evidence for this claim, but the Birthplace Trust purchased the painting and launched it upon the world through the “Shakespeare Found” touring exhibition in 2009. “The painting’s claim to authenticity seems to be, according to the Shakespeare Birthplace Trust, that it “may” have been commissioned by the Earl of Southampton. They then go on to repeat a widely held myth that Southampton was Shakespeare’s patron; but there is no evidence that this was true. Or that the earl and the playwright knew each other or ever met or spoke. “When the exhibition opened, the claim that this was a portrait of Shakespeare was met with a mixture of incredulity and hilarity by many scholars, not least because it was already widely accepted as a portrait of Sir Thomas Overbury, a courtier and poet who died in 1613. This did not deter the Birthplace Trust, however, which pressed on in its quest. So, why was the trust so determined that the world accept this portrait as Shakespeare? “Well, compare it with the only accepted picture we have of the bard, the Droeshout engraving. Which one would you rather were the author of the most famous romantic tragedy, Romeo and Juliet? “Essentially, it seems that the trust feels that the Droeshout engraving portrays someone who is too ugly, too plain and too ordinary to have written such magnificent works of literature. Thus the desperation to find a debonair substitute – and one in colour! “Just in time for his 400th anniversary, Shakespeare’s image has been given a makeover, one befitting our image-conscious society. It is said that the truth is constructed through “iteration and reiteration” – not by something being true but by the constant saying and resaying that something is true – and we see this happening in front of our eyes in this 400th year. The constant saying and resaying that the Cobbe portrait is a likeness of Shakespeare develops to become the truth – it is a likeness of Shakespeare – despite the fact that it is not him. “Such is true of the various “Shakespeare houses” in Stratford-upon-Avon. For, as I have argued elsewhere, Shakespeare’s birthplace is not the house where he was born; there is no evidence to suggest that Anne Hathaway ever had anything to do with “Anne Hathaway’s cottage”, that Mary Arden (Shakespeare’s mother) ever lived on “Mary Arden’s Farm” or that any of his family lived at “Hall’s Croft”, which according to the trust’s website was “the elegant home of Susanna Shakespeare [his daughter] and her husband, Dr John Hall”. Thousands of tourists even flock to “Juliet’s balcony” in Verona!